Kid food games are a great way to teach children about nutritional values and meal planning. Whether you are introducing your child to the food pyramid for the first time, or want to stimulate his or her interest in cooking and meal preparation, the following enticing ideas are sure to spark young minds and appetites! 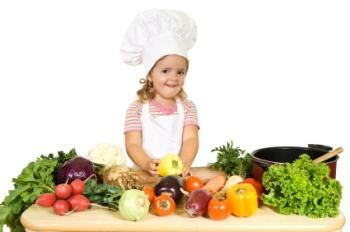 Many kids love to learn about the five food groups and are usually more than excited to master basic cooking skills. Try incorporating these simple kid food games into their daily activities to stimulate their interest in health and cooking. A simple kid food game is playing grocer. Toy food is available in both wooden or plastic forms and is a definite must for the child who has a play kitchen! Children can weigh produce, bag groceries, and even play cashier with toy cash registers. To add to the fun, kids can divide the toy food into the appropriate food groups. This is a multi-level activity that can be played for hours! Pots and pans will advance this game to the pretend-play cooking level. If you sit down weekly to create a grocery list, why not make it a game and involve the kids? Divide the food groups onto a piece of paper, and when a grocery item comes to mind, say it aloud and ask your child to tell you where to write the item on the list. Once you get to the grocery store, ask your child to help hunt and gather the items on the list. Soon they'll be able to navigate the dairy items from the fresh produce and meats and protein! A popular game amongst nutritionalists, teaching kids the difference between "real" (unprocessed, natural foods) from "fake" (processed, refined products) helps them better understand nutritional values and healthy food options. Flip through magazines and point out food items and ask your child to name whether they are real or fake. A great summer outdoor activity and game is to grow your own vegetables or fruit! Even if your yard or gardening area is limited, patio tomatoes or strawberry plants require little space and only require full sun and water. Once young children see a small flower transform into a fruit, they'll almost always have a newfound appreciation for homegrown, nutritious foods. Memory cards are a favorite travel game for kids. To turn a simple memory game into a food game, print a set of two color photos from the Internet of at least 20 food items. Paste photos on heavyweight cardstock and get ready to play! Just like the traditional memory game, lie cards face down and allow each player a turn at flipping a card over, hoping to remember where its match is. Once you have a set of memory or flash cards featuring food items, you can take the game one step further and play the food pyramid. The object of the game? Figure out where on the food pyramid the featured item belongs! This game can also be played without flash or memory cards. Simply call out the name of a vegetable, fruit, dairy, grain or fat item and let kids take a gander at where the item belongs on the food pyramid. Kitchen games can really help children become more aware where the food they consume comes from, and what healthy food means in the spectrum of unprocessed and fresh options. Any of these fun-filled games will help your child understand the importance of eating right. Once he has a better understanding of food groups and grocery shopping, why not include him in meal preparation activities? For further reading, check out Cooking with Kids and get inspired with Fun Kids' Recipes.